Experience the elements with Smart Noise™ - audio CDs, Mp3 downloads, and DVDs filmed in high definition to capture, and deliver to you, the true sights and sounds of nature. Experience the sights and sounds of nature with Smart Noise. 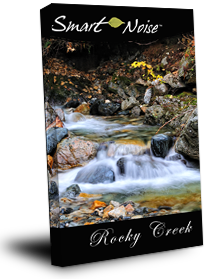 Filmed in high definition, this standard Smart Noise DVD: Rocky Creek contains a series of scenes set to 60 minutes of uninterrupted sounds of the natural flow of water. Follow the path of the creek as the water gently moves over the rocks, rushing around winding turns, as it makes its way to the river below. By combining soothing imagery and the relaxing sounds of nature, Smart Noise is an inviting long-playing motion picture suitable for video monitors in corporate offices, medical centers and retail establishments, and it makes the perfect background noise for relaxation, quiet time, reading, sleep aide, meditation and yoga.